The Winter Artist in Residence idea came to fruition because of my friend Julia. She works at a Montessori school as the Outdoor Classroom Instructor. I wrote about this in January. Click HERE to read more. As part of the Winter Artist in Residence, I taught workshops for kids which I wrote about HERE. As a thank you to my friend for helping me run these workshops, I offered to create an EcoMemory for her as a form of bartering services, my creating art for her and she helping me run a classroom of active young children. There is no way I could have done these workshops without her. Back in January, we sat down to talk about her special place in nature. She knew what this was about so she had spent some time thinking about her special place. It’s interesting to note other people I have interviewed so far for their custom EcoMemory thought about nostalgic times from their childhood. My friend decided she wanted to do something more in the present moment that would remind her of her sense of contentment in nature. She wanted to be reminded of the beauty and joy of just being in nature especially during her regular runs in a local nature preserve. The advantages of this is I know exactly where this nature preserve is located. So I went and scouted out the location and took actual photos of the landscape. This helped with my design work. The particular moment she chose for her EcoMemory subject occurred when she had been running and noticed the beautiful fall sunset over the prairie and oak savanna in this nature preserve. As she stopped to admire the colors of the sunset, Sandhill cranes flew in and landed. If she hadn’t stopped to watch the sunset and paused during her run, she would not have seen the Sandhill cranes. Sandhill cranes are beautiful gigantic cranes. They are a sight to behold. As a species they have made a huge resurgence in numbers up here in the Midwest. Ten years ago we never would see a Sandhill crane in a local nature preserve. Sandhill Cranes Landing, 2018. For Julia. I had my work cut out for me since this was the most complicated design I had attempted on an EcoMemory project so far. I wanted to focus on the sunset, the landing Sandhill cranes, and the prairie and oak savannah. No big deal. I can get this done in one 10 inch square artwork, right? As always, I started with research. I found my reference photos and used these glorious photos of cranes about to land from this website. I used these photos to design a geometric shape to depict the cranes landing. Their red head is 1/4 inch high. Super tricky to sew. Then I knew I wanted the colors of the sunset and horizontal lines to depict it. The next design element was the prairie itself which is full of various browns for the fall prairie grasses so I added the vertical elements in browns. For the oak trees in the distant horizon, I added dark brown horizontal lines and matched it to the actual location where I knew the trees were taller or shorter. Where there were no trees, I have the yellow sun coming through in the break in the treeline. I presented the EcoMemory to my friend right before we set up a display for the Winter Artist in Residence at the school. She really liked the EcoMemory report which explains how I incorporated what was important to her into the artwork. Again this is just a confirmation that writing this report is a key part of the process. The other key part is obviously that first conversation. I have learned it isn’t so much where the special place in nature is, but how this special place makes you feel. When my clients see their art on the wall, they remember that feeling of the place. I think that she really liked her EcoMemory because she’s recently commissioned me to make an EcoMemory for her mother for her birthday. That’s what I will be doing the end of this month. This just reinforces the fact that small businesses get most of their work through referrals. I read a statistic saying 80% of small businesses’ work comes from referrals. So as a Studio Notes reader, feel free to send me an email if you have someone who has a special occasion coming up and want to commemorate a special place in nature you share. I would be happy to discuss this with you. Just let me know how I can help. 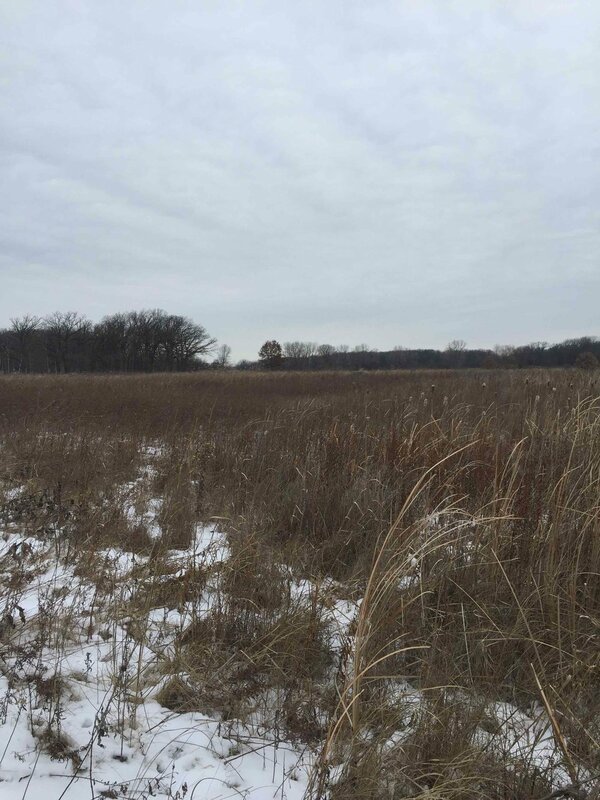 Nature Preserve actual photo showing grasses and oak treeline in the horizon.